Sarko wins - big time. Three cheers for France! Maybe we will finally have a friend in Paris. Al Zawahiri mocks Dem Iraq pullout plan. We all die of heat in 8 months. Yikes!�Better bring my will up to date. Wait a minute - that will be mid-January. What the heck? The wrong house from which to steal a gun. Picking a jury for the Padilla case. Are people really this stupid? The DC Madam's employees: It's hard to say that these hos had no choices in life.�They were moonlighting. Tony Blair plans last-minute surrender to the EU.�These are not our grandparents' Brits. Devil in�a red dress. Big Lizards. Condi scares the Imams away. Is there a military tactic to be learned from this? Maybe get the Dallas Cowboy cheerleading squad to�stroll around Sadr City for a few hours a day in skimpy cowgirl outfits. Where is Annie Oakley when you need her? A bad joke? No. It's our new Dem leaders. How the Nanny State kills. Bainbridge. On a similar subject, Brit NHS docs finally admit rationing of care. Dem. Project. Vilmar Tavares shares his Antarctica adventures. Hmmm. Does that mean one�less than I have now? How do I do that -�is that an Abraham and Isaac-type command from Gaia?�Or does he mean one less than I wanted? What if I only�wanted one?�What if I have one more by mistake? I need more detailed instructions, please, from our wise�government officials, or I won't know how to live. Also, I wonder whether this just applies to the English, or does it apply to their�immigrants too? Have they informed them, yet? 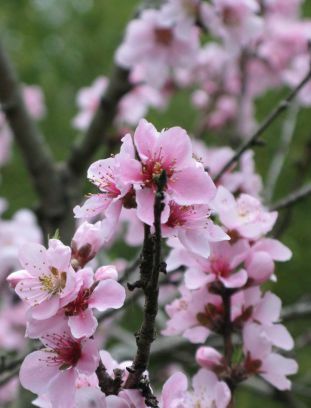 Photo: A nectarine bloom in southern New England this weekend, sent in by a reader. Don't send 'em Annie Oakley--send 'em Calamity Jane! How many times did they say "right wing" in that article? The guy seems about as right wing as Hillary Clinton. I missed that you already had the Newsweek piece on pieces-for-hire. Some folk will be shocked, but welcome to the real world. Now I'm just confused--what has Tony Blair got to do with the DC prostitutes? And they with the EU? Either I'm cracking up (other evidence exists) or somebody fixed something--I now see the Telegraph article. Not clear to me what difference in fact it will make. My comment won't make sense at all if you don't know I sent it in by email--then discovered it was already here. In other news, on the item about the Padilla jurors--I'm not so sure I agree that any of them said anything stupid. All I know about the 9/11 debacle is what the MSM told me, and I don't, as a matter of practice, believe anything they say and very little of what they show me. Since that time I have done a bit of analysis ("signal processing" to see what seems to be consistent and what does not, but if fact with a court oath and an inability to establish my credentials as an expert, I'd have to answer much as they did. Already did, LS. I have friends who saw it all happen, from the ground. My daughter lives and works not far from the site. I believe it happened. But when it comes to swearing under oath that I know of firsthand knowledge why it happened, ... well, that is not so clear, from first hand knowledge. The story of who, and how seems to be pretty clear from analyzed and de-spun MSM reports, but why is still not so clear. I must cry the simpleton plaint. Who and how give great credence as to why. At least to a simpleton's point of view. The under oath, why, may require OBL's presence. I have small hopes that that may not be possible. Then we are left with only deduction and/or circumstantial inference. Works for me. Right. I'm a simpleton, too. When you hear hooves in horse country, it probably ain't Zebras. Al Zawahiri wants 200,000 US dead? Problem with that. At the current 20 to 1 rate of exchange that would mean 40 million Terrorist causalities. Iraq only has a total population of 26 million. And frankly, when we get into megadeaths a whole different set of weapons comes into play and the rate of exchange becomes even more favorable to the US. Too busy to try and find a cite. But I was listening to the Dennis Miller radio show the other day and he was interviewing a co-author(?) (never heard a name) of the most comprehensive survey yet done on the worldwide Muslim outlook. Twenty-five percent of same hold the opinion that terrorist violence is appropriate for the expansion of their religion. That is two hundred and fifty million people. I guess one question would be how many of those support Al Zawahiri?